A mini on the SoCal indy scene. Began his training at the age of 13. 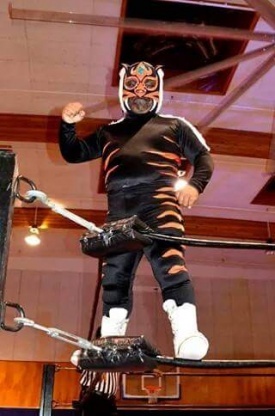 He made his debut on 2003 in Arena Zapata, en Guadalajara, Jalisco as Comandito Nazi. Then he went under other identities such as Pequeño Puerrero, Misteriosito, and Felinito. He changed ti Micro Tiger Dark because the name of Felinito went to another Miniestrella (Pequeño Felino). As Misteriosito he wrestled in Lucha Libre USA. As Felinito he wrestled in several cities in California and almost all over the United States. He also wrestled in Lucha VaVoom. He is mostly rudo. This page was last edited on 30 August 2018, at 07:48.